Dr. Anish Vaknalli's views on the Indian Governments decision to allow Homeopaths to practice Allopathy after completing a short allopathic course. 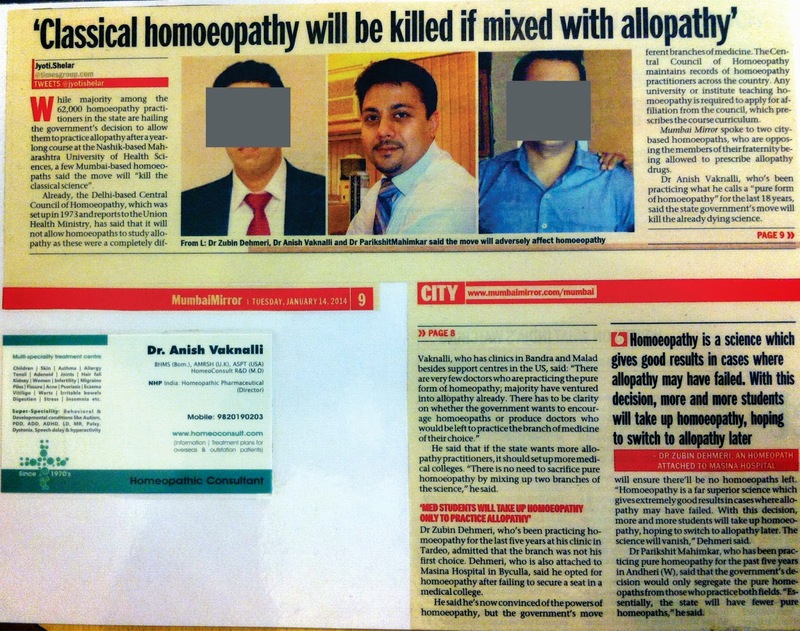 His view was that 'Classical Homeopathy will be killed if mixed with allopathy' is evident with the rising number of Homeopaths today choosing mainstream allopathic practice rather than using their Homeopathic knowledge to better use. Surprisingly, though the popularity of homeopathy and its preference for children and chronic ailments in on a significant rise, new Homeopaths, due to lack of practical knowledge and confidence, aren't using this opportunity to build on their practice. His view that the government should promote homeopathy and offer better opportunities to new Homeopaths rather than sacrifice Homeopathy was appreciated widely in the Homeopathic community as mentioned in this article.